In one of his essay V.V. Mayakovsky said: «The new word of art is constructivism … first appeared from Russia.» Let’s find out how and why is it connected with Stalin’s five-year plans and the architecture of the time. Constructivism was considered to be one of the best areas of proletarian art. The basic principle of constructivism in his statement expressed Arvatov Boris: «… the one will not express a beautiful body, but educate the real alive, harmonious person not to paint forests but to grow parks and gardens, not to decorate walls with paintings, but to paint these walls». Constructivism as no other art form was directly intertwined with Russian realities of the 1920s. The national economic plan, scheduled for 1933-1937 years, was carried out ahead of schedule – for four years and three months. And a crucial role in achieving such a high result has played all the same «constructivism.» The new direction called artists do useful things consciously. The goal was reached, but «sweeping away» of the objectionable decoration of building constructions led to poor appearance of building facades of the time. The style was completely deprived of mysterious and romantic aura. No way, when the people were turned into a workforce that does not require any cost, and is controllable easily. It’s not up to romanticism. The building on the Gagarin 6 avenue belongs to the monuments of constructivism. The house was built under the slogan «Five-Year Plan for four years», and it reflected in its design, which had a view of the combined numbers «4» and «5». The appropriate form heading, constructed by machine production, was fully reflected in the simplified facade of the building and «denudation» of the form, free of decorative handmade artistic decoration. Rationalism, manufacturability, functionality, practicality, tectonics, texture of the material — these are the criteria ruled by during buildings constructing. These concepts are the main categories of architecture constructivism. Even the term «artist» at the time is replaced by the word «master». Currently, the house is an object of cultural heritage. In 1941-45 the number «4» has been destroyed. In 1946 the building was restored. 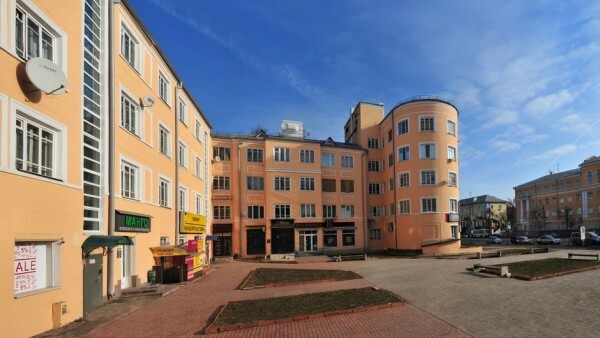 Mass innovation of the middle of the second five-year plan has confirmed the prospect of the building constructing — currently the object is used for housing, large underground accommodation and the first floor area and are widely used as place of business.